The identity of this bird either jumps out at you or it doesn't. It's safe to assume that this is a waterbird of some kind since it looks like it's sitting on water. 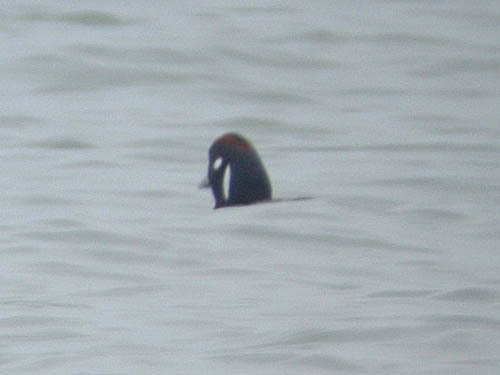 The two white marks on the side of the dark head really don't work for anything except a drake Harlequin Duck. The rufous stripe on the top of the head shown by male Harleys is also visible on our quiz bird. This adult male Harlequin Duck was photographed at Wind Point in Wisconsin on December 31, 2005. The warm brown plumage, prominent crest, and dark bandit's mask identify this bird as a waxwing. The usual way to identify waxwings is to look at the color of the undertail coverts (red in Bohemian, white in Cedar) or the pattern of the wings (Bohemian has white or yellow tips to the primaries, Cedar doesn't). Since these areas aren't visible on our quiz bird we'll have to examine the head for clues to its identity. Our quiz bird has a whitish line over the black mask, a mark only Cedar shows. Bohemian Waxwing also has rufous in this same area, which our bird lacks. Finally, Bohemian usually shows a fuller dark throat patch compared to Cedar. The throat patch on our quiz is greatly reduced. 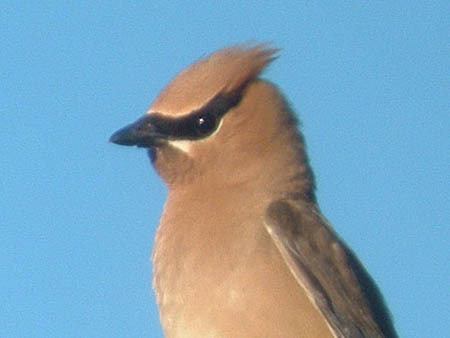 This Cedar Waxwing was photographed at Montrose Point in Chicago on September 2, 2005.